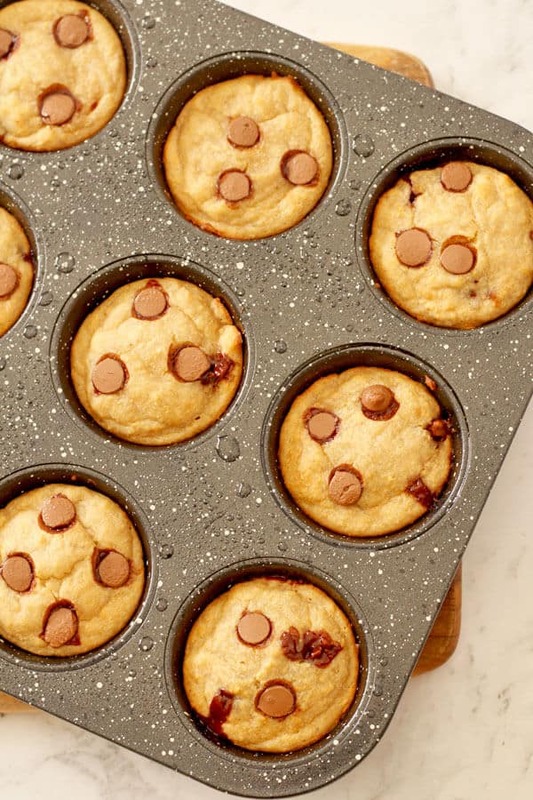 These deliciously Healthy Banana Chocolate Chip Muffins are perfect for using up those overripe bananas sitting on the bench. Ready in just 25 minutes, you can enjoy these muffins for breakfast, snacks or dessert. These Banana Chocolate Chip Muffins are a staple in our house. We just can’t get enough of them! I’ve tried a bunch of healthy banana muffin recipes over the years that taste dense and gross and end up in the bin. This is not one of those recipes. Made with easy everyday ingredients like whole wheat flour, greek yoghurt, egg and olive oil, you’ll love how quickly these muffins come together. 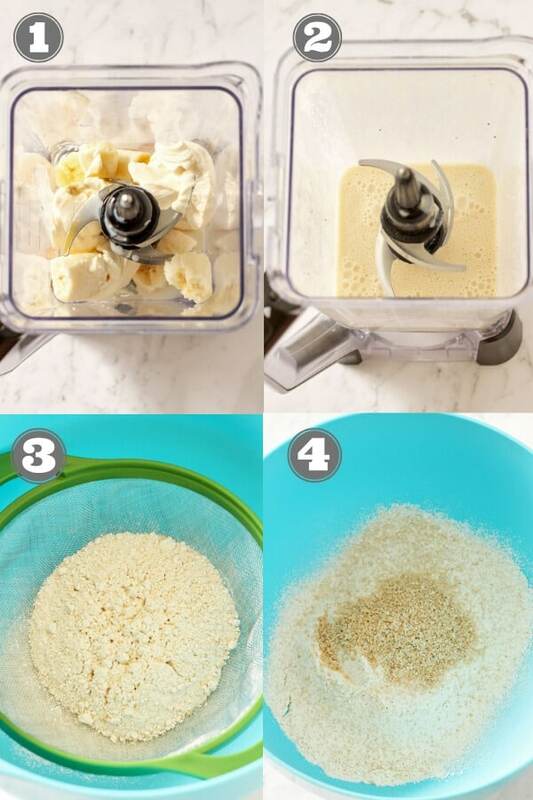 Just pop all the wet ingredients in a blender and blitz until smooth. Then pour over the dry ingredients and mix until combined. Add in some choc chips and spoon into muffin tins. The hardest part is waiting for the muffins to cook. They’ll make your home smell absolutely divine and your tummy will be seriously grumbling when the timer finally dings 20 minutes later! Very Ripe Bananas – The spottier, the better. Olive Oil – Or you can use coconut oil instead. Milk – Works with any milk, so just use what you have on hand. Rice Malt Syrup / Brown Rice Syrup – Or you can use honey or maple syrup instead. Whole Wheat Flour – Or you can use white all purpose flour instead. Preheat oven to 170C or 350F and spray a 12 cup muffin tin with non-stick spray. 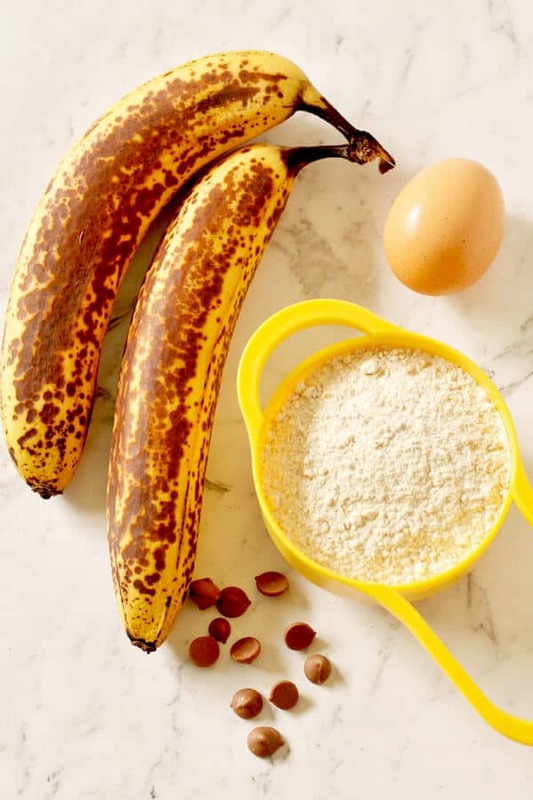 Add bananas, rice malt syrup, vanilla, oil, egg, yoghurt and milk to a blender and blend on high for 1 minute until well combined (photos 1-2). Sift flour and baking powder into a large mixing bowl, then whisk together with a pinch of salt (photos 3-4). Add the wet ingredients to the dry ingredients and mix until just combined. Don’t over mix (photos 5-6). Gently fold in chocolate chips (photo 7). Divide batter into muffin tins and bake for 20 minutes or until tooth pick comes out clean (photo 8). Cool muffins in tin for 5 minutes then move to wire rack to finish cooling. No one likes a stale muffin. Once your muffins have cooled completely, transfer them to an airtight container lined with paper towel. Once the muffins are assembled, pop a paper towel on top and close the lid. Store the container at room temperature away from direct sunlight for 2-3 days. These muffins freeze wonderfully and are great for meal-prep snacks or lunchbox fillers. To avoid freezer burn, individually wrap the muffins in plastic film / cling wrap, then pop altogether in a freezer bag or airtight container. Freeze for up to 3 months. 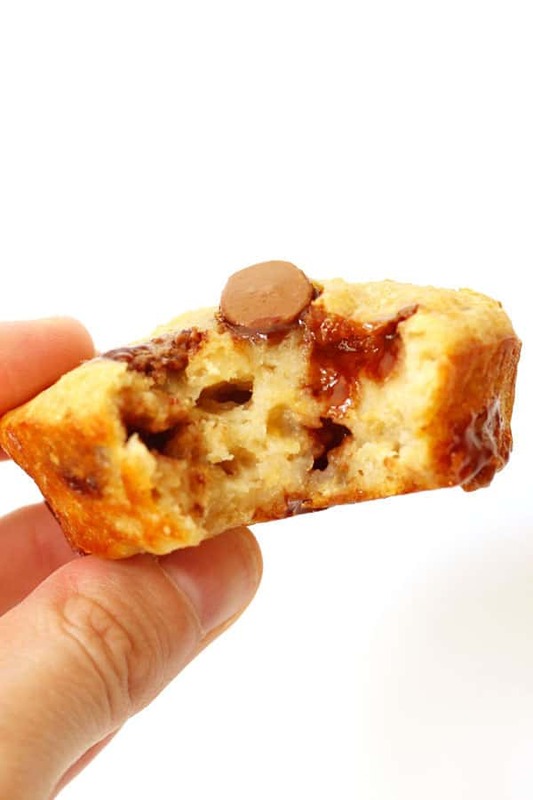 If you’ve tried this Healthy Banana Chocolate Chip Muffin I’d love to hear how you enjoyed it! Pop a comment and a star rating below! You can also FOLLOW ME on FACEBOOK, INSTAGRAM and PINTEREST to keep up to date with more delicious recipes. 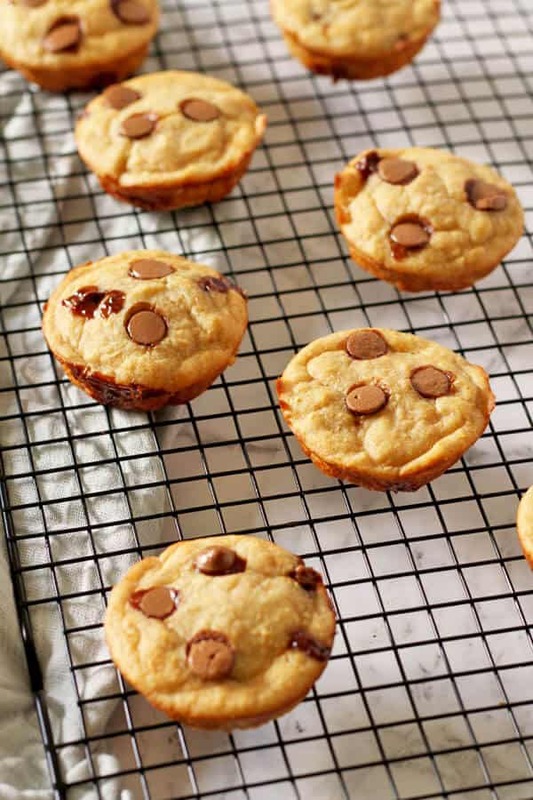 These deliciously Healthy Banana Chocolate Chip Muffins are perfect for using up those overripe bananas sitting on the bench. Ready in under 30 minutes, you can enjoy these muffins for breakfast, snacks or dessert. Preheat oven to 170C or 350F. 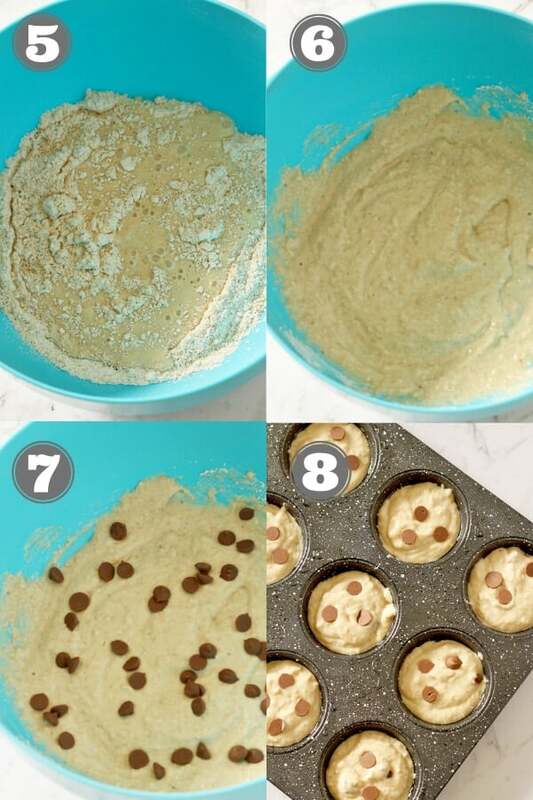 Spray 12 cup muffin tin with non-stick spray. Add bananas, rice malt syrup, vanilla, oil, egg, yoghurt and milk to a blend and blend on high for 1 minute until well combined. Sift flour and baking powder into a large mixing bowl, then whisk together with a pinch of salt. Add the wet ingredients to the dry ingredients and mix until just combined. Don’t over mix. 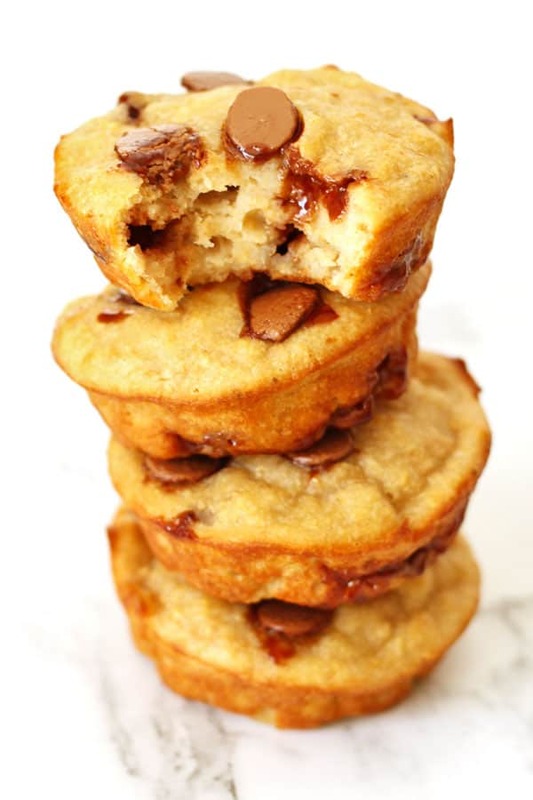 Divide batter into muffin tins and bake for 20 minutes or until tooth pick comes out clean. Bananas - This recipe works best with very ripe bananas. The spottier, the better. Olive Oil - You can use coconut oil instead. Milk - Works with any milk, so just use what you have on hand. Rice Malt Syrup / Brown Rice Syrup - You can use honey or maple syrup instead. Whole Wheat Flour - You can use white all purpose flour instead. Storing - Store in an airtight container lined with paper towel at room temperature for 2-3 days. Freezing - Individually wrap the muffins in plastic film / cling wrap, then pop altogether in a freezer bag or airtight container. Freeze for up to 3 months. Updates - First Published July 30, 2018. Last Updated March 5, 2019 with new photos and tips. No changes to the recipe. Nutrition - Nutrition information is a rough estimate based on one muffin. Just so you know the ingredient list calls for baking powder but directions mention baking soda. I ended up looking up original recipe to clarify. Thank you for a great alternative! lovely recipe. i love banana chocolate combination. these are surely a helthier version. am definitely trying these soon. I love banana chocolate too!! Loving the look of these, especially how easy they look to make! Ok, these look completely amazing. I could eat all of those in one sitting! I am a huge muffin fan! You and me both Amber! My plan is to make a couple dozen muffins this weekend to stash in the freezer for on-the-go breakfasts, etc. These sound great! That sounds like a great plan Renee! Awesome Louise! Hope you enjoy! There isn’t anything untasty about these muffins. My husband would devour a whole batch on his own. Your husband and me both Cassie! I have to really stop myself eating the whole thing! I know this is good, because reading the recipe makes me hungry already! Naww thanks so much Yasmin! Yum. 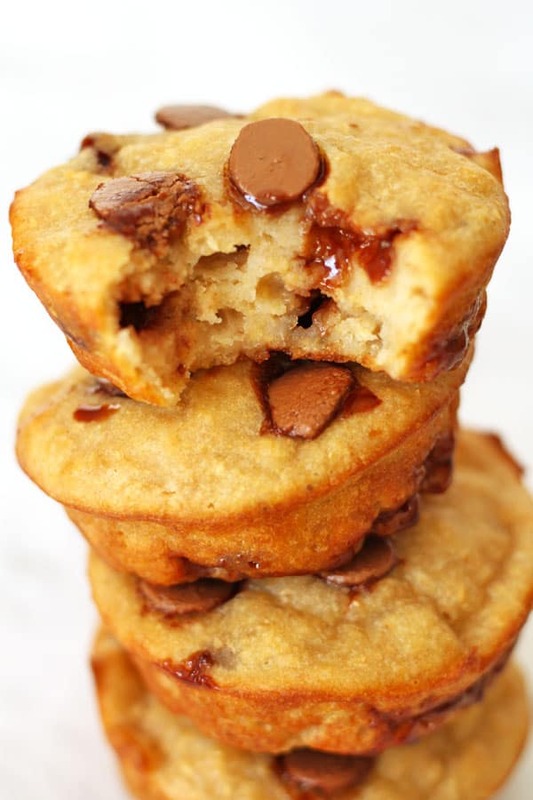 i want to make muffins today so this is a great post to stumble upon. I will try this recipe it looks DELICIOUS! Awesome Jeanine! I really hope you enjoy! Omg these chocolate banana muffins look delicious! I love making muffins and banana ones are one of my favorite to make. I need to try this recipe. I hope you love them Tracy! Yum. I’ve made muffins similar to this, but with only 3 ingredients. These look a lot heartier. I especially love the addition of the vanilla. 3 ingredients!? Wowser – that sounds great! Thanks for this, my daughter wants to have ago at making these yummy Muffins!! Thanks for your post!! These look delicious! My kids would love these. 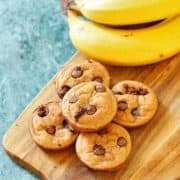 They love bananas and chocolate too so I will make this for the family to enjoy! That’s awesome Kristina! Hope you all enjoy! These looks so yummy! I definitely need to give this a try! I hope you enjoy Rhian! I love muffins! They’re filling and easy to make and perfect for breakfast. These are great, I always like the combination of banana and chocolate too! I love that the recipe is flexible. Thanks Amanda! Glad you like it! The muffins looks delicious. I will definitely try to make it asap. Thanks for sharing. These look SO good! I love anything with banana and I’m always looking for new recipes to try out when my bananas ripen. Can’t wait to add this one to the list! Hope you love it Megan! I’m always looking for another breakfast/snack alternative for my kids. This looks like a great recipe. Thanks so much Heather! I hope you enjoy! I’m with you, I’ve had some healthy muffins that aren’t good at all! The ingredients sound like they make a great healthy muffin!! Thanks Joanna! I’m happy to finally find a recipe I like! You had me at healthy! This sounds delicious, and just what I need this summer! Awesome Theresa! Hope you like them! These look fantastic! I love all the substitutions you can make. They look so yummy while also being healthy. I’m forever buying bananas thinking I will eat them before they go bad, and I never do, so this is a perfect solution. Can’t wait to try! Awesome Allie! Hope you enjoy them! I love the “lightbulb” saying when it’s done right! Despicable Me is such a good movie! These look so good, Banana’s never last long enough in my house. I loved the movie Angela! These look so good! I am ready to bite the screen! These look delicious. The last time I saw a similar recipe on Pinterest I tried whipping it up from scratch it didn’t come out like this. Haha. I’ll leave it to you. Haha Jalisa we’ve all been there! Love banana chocolate muffins. I can have them for breakfast everyday. These look delicious. Yum! So good for breaky for sure! I love things like this that I can grab and go with. I am always running out the door without eating, so these are perfect. Perfect for running out the door! Great to know that the muffins freeze well. I will try out the recipe and I appreciate that a lot of ingredients can actually be substituted! Awesome Shoshana! Hope you like it!